The german company SIBRE – Siegerland Bremsen GmbH (SIBRE Brakes) is a major system supplier with representatives throughout the world. SIBRE operates production branches in China and sales and service branches in India, Spain, Italy and the USA. The current portfolio is characterized by a wide breadth and depth of standardized heavy duty industrial brakes and components for drive technology. This allows the company to fulfil nearly every market demand because a field-proven standard product is always the basis for customized specifications. Modern belt conveyor systems for mixed uphill and downhill mining operations or for mechanized tunnelling often come along with additional drives for more powerful thrust. Downhill conveyor systems have to handle extremely high conveying capacities (with correspondent weigth of the excavation material). All these applications have to function in harsh environments and locations are often far beyond accessibility for fast maintenance. Therefore, it is all the more important that reliable and low-maintenance brake solutions are being used as service or emergency stop brakes. As one knows, effective maintenance procedures for conveyor systems can boost productivity — and this is true also for the brakes in the drives! For many years SIBRE disc brakes type USB (service/ emergency) and calliper brake SHI (holding/emergency) provide an established and proven equipment meeting the highest safety standards and low maintenance costs. Because of their lining wear compensator, their stainless steel pins with teflon coated bushings and the synchronization linkage USB brakes can be considered as the first virtually maintenance-free disc brakes. With a brake torque up to 23000 Nm (USB) and a clamping force up to 555 kN (SHI) both brake types offer high power reserves. An improved version of the USB with a clamping force up to 95,000N is under way with the development objective: higher torque, less weight due to unique lever geometry and smaller thrusters. SIBRE has successfully realized many international customized projects in the field of brakes refurbishment (and of course initial equipment) in conveyor systems and band drives of different type in recent years. 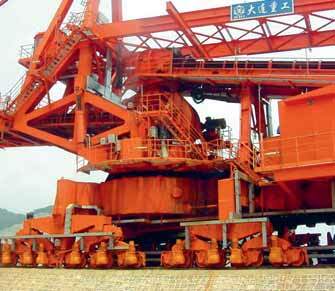 For instance 190 USB brakes had been installed in band drives and conveyors of lignite mining in Greece. Several SHI brakes with tailored Hydraulic Brake Control Units are being currently supplied for the Pilbara-site of Rio Tinto in Western Australia. To reduce mechanical stress and destructive forces on gear box and the conveyor belt, a set of adjustable hydraulic components is incorporated in the brake control unit for a smooth and controlled induction of braking force. Pre-set, adjustable components guarantee an easy and reliable fine-tuning of brake control at site. In 2012 SIBRE provided 150 sets of large SHI brakes and hydraulic units (to some extent in explosion-proof design), 20 sets of USB brakes and over 80 sets of drum brakes for conveyor projects in China, amongst others to Shenhua Group Co. Ltd. The Open Pit coal mine East of ChinaCoal Pingshuo Co., Ltd., located in the Shanxi Province, uses more than 30 sets of USB brakes since 2011. First of all these figures indicate one thing: trust. Trust in the proven performance of SIBRE brakes. Over 50 years of company history mean a huge amount of experience in industrial brakes manufacturing. This is the reason for SIBRE being an ideal partner for brake refurbishment in conveyor systems of the mining sector. In addition to the product quality, the cost- efficiency of a brake system, i.e. the lowest possible service life costs for the system with regards to maintenance and ongoing operation, is a significant factor for industrial systems operators. For this reason, SIBRE not only is focused on new product developments; but also places high value on optimizing mechanical properties and monitoring of its brake systems. The SIBRE Intelligent Brake Control System (IBC) for SHI brakes is ideally qualified for the exact observing of essential safety functions and control of brake cascades in mine belt conveyors. The IBC (developed by Sibre Brakes Tianjin Co.,Ltd.) is predestined for modernization and upgrading of machines and drive systems. It is designed as a redundant system with two hydraulic power units and comes with an uninterruptible power supply in case of power failure.